(A) Pedigrees for 3 kindreds with recessive mutations in LIG1. 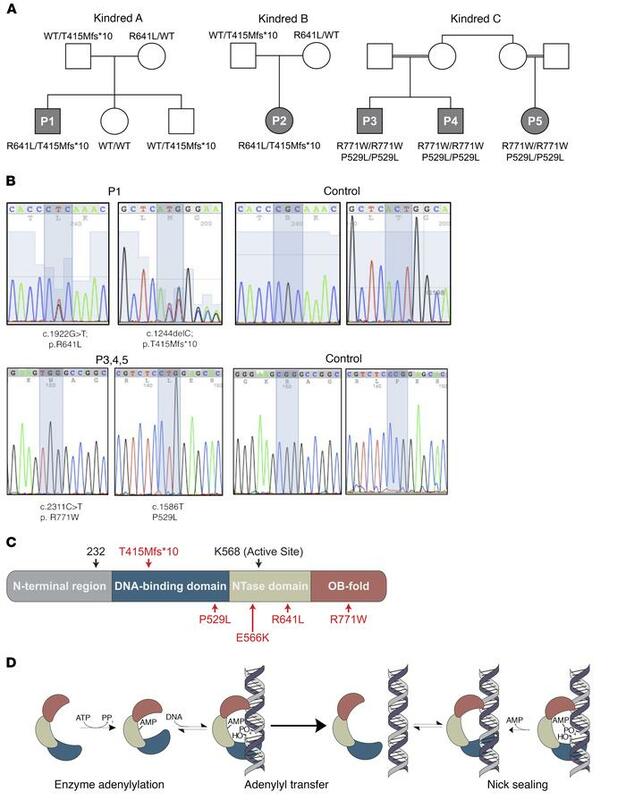 Patients 1 and 2 (P1 and P2) are from unrelated parents and both have the LIG1 mutations T415Mfs*10 and R641L. Patients 3 and 4 (P3 and P4) are brothers whose parents share grandmothers; patient 5 (P5) is a maternal cousin; these subjects have homozygous missense variants, P529L and R771W. The parents of P5 also share the same grandmother. (B) Sanger sequencing of P1 and a control, also P3 and a control. (Note that P2 has the same mutations as P1 and that P3 has the same genotype as P4 and P5.) (C) Schematic of LIG1 protein structure and approximate locations of all the identified mutations, in this and prior reports (16, 17). (D) Mechanism of LIG1-catalyzed DNA ligation. LIG1 consumes ATP and forms a covalent bond between AMP and K568. AMP is then transferred to the 5′-phosphate of a nicked DNA substrate. Attack by the 3′-hydroxyl seals the nick and releases AMP. All 3 chemical steps require Mg2+ as an essential cofactor.